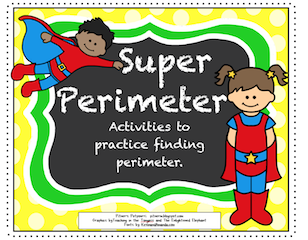 The Best of Teacher Entrepreneurs III: Math Lesson - "Super Perimeter--Activities for 3rd Grade CCSS on Perimeter"
Math Lesson - "Super Perimeter--Activities for 3rd Grade CCSS on Perimeter"
Need some super ideas for teaching perimeter? Here are five fun activities to address the 3rd grade CCSS on perimeter. Activities include task cards, Scoot game, game board, dice game, and a matching game for irregular shapes. You can use it for enrichment for second grade and intervention for fourth grade, too! Just click on the pic above to go directly to my TpT Store to see the packet.